Like father, like son – even while they’re sleeping! Why does it always have to be so difficult to go from one photo to the next ?? I hope you find a way to improve that point. Well, Mary and Nancy, I agree that it is a PIA convoluted viewing process. The reason is the new add you are forced to see each time you want the next picture. Overkill. We either put up with it or unsubscribe! I never buy from companies who force ads on me. Very nice photo’s of puppies, and parent. It is a shame humans don’t show the same way about there off spring. LOVE LOVE LOVE THE PICTURES! I WISH MY KIDS WOULD HAVE SO CUTE AS THESE PUPPIES !!!! Gorgeous pups, look like petite balls of fuzz. Specifically liked #6,#11 and #25………. Unless I’m mistaken, No. 19 is a Mom. I know right so cute ??☺???? And #7 is so adorable! These pups and Moms are just the most adorable, The Keeshond Mom doesn’t look very loving but, having had one, they are outstanding. They bark when anyone or anything, like deer, are around or someone is on your turf. To look their best they do need grooming. However, if you know how to do it, it’s a wonderful bonding experience. Grooming, combing, brushing is no big deal. It has to be tended to, however. Keeshonds will be your best friend and protector. These pictures are fantastic. Really cheered up my day. But I do believe that #19 is a bit wrong. 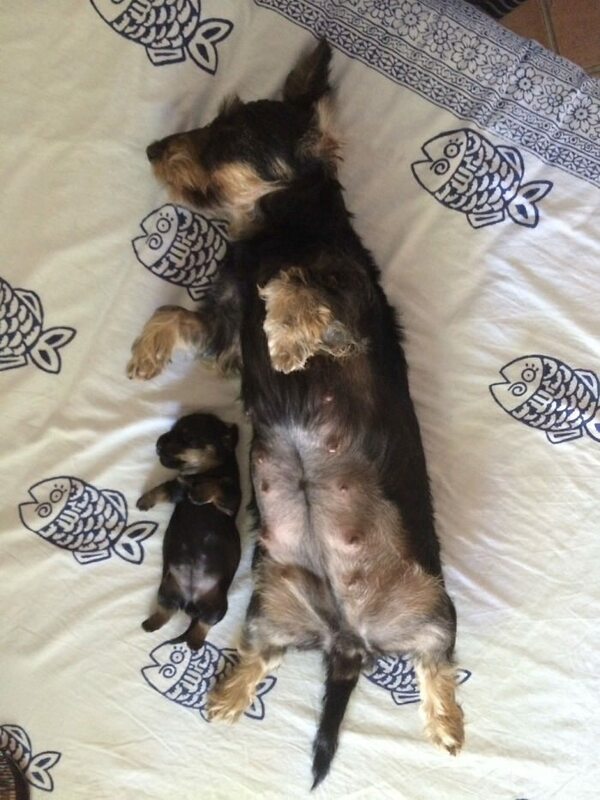 I would say that the larger dog is the Mom, not the Dad. Sorry to correct you again. I did this the last time you published these pictures. If you need a new person to caption your pictures, I would like to do this as a side job. Today most people do not proofread their work. But then again, no one is perfect. with one exception..if you are going to publish..then your work needs to be perfect…sorry..just the way it is! Even I can see there’s something “missing ” if that is the father!!!! I have to agree with Sandra. That’s not dad but mom taking a nap with her son. I am looking for a pet too adopt. would prefer a small too a medium size dog . have previously owned a Boxer great dog’ but some thief wanted him more than me. You mean you didn’t want him enough to protect him from thieves. THE SO called DAD in #19 is a MOM unless we are now having TRANSGENDER DOGS….. Most addorabel puppys i ever seen!! !